Perfectly nestled in picturesque Tanjung Said Bay, overlooking the alluring South China Sea, Angsana Resort & Spa Bintan is a cozy enclave featuring touches of contemporary Asian design. Only a 45-minute catamaran ride from Singapores Tanah Merah Ferry terminal, you will find this idyllic seaside resort surrounded by a tropical rain forest, and within easy reach of Laguna Bintan Golf Club. Boasting spectacular balcony views of the South China Sea, all rooms promise a comfortable stay for guests who embrace style and quality with tasteful contemporary furnishings accentuated by local artifacts. Club members may choose from three room types; a stylish hotel unit, or spacious, family-friendly one-and two-bedroom suites. Beautifully appointed, the suites feature separate living and dining area, master bedroom with queen-size bed, private balconies and fully equipped kitchenette. 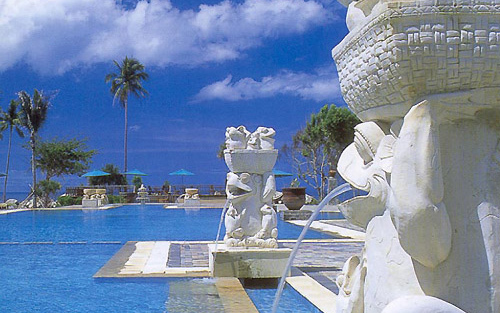 The world stands still, while you experience true serenity and bliss at Angsana Resort & Spa. The perfect retreat for your mind, body and soul, there�s only room for rejuvenation and relaxation here. Like the exotic and majestic Angsana tree, the Angsana Resort & Spa Bintan bears the unique qualities that this tropical treasure represents. Eat to your heart's content at the Angsana Resort & Spa. 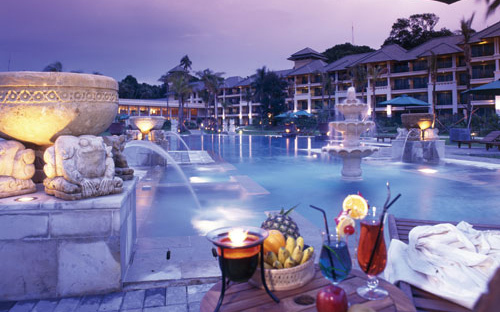 Laguna Holiday Club members vacationing at this exotic getaway have a wealth of dining options at their disposal. Take a break by the pool and enjoy a refreshing cocktail over light snacks, sandwiches and salads. During weekends, the luscious whiff of barbecued seafood floats through the air as you tuck in, with the South China Sea serving as the perfect dinner backdrop. From the indigenous to the international, gastronomic treats from all corners of the earth await you at the Lotus Cafe. Sharing your table with popular Indonesian and Asian specialties are the perennial Western favorites on the la carte menu. Choices abound with our extensive breakfast and dinner menus, as theme nights serve up innovative dining concepts on a dish. Here, the catch of the day, is the order of the day. Enjoy your seafood delicacies seated in a traditional fishermans boat with the powdery sand between your toes. Highlights include wok-fried chilli crab from Bintans mangroves served with bok choy, mango chutney and steamed jasmine rice. Using vibrant colours in an alfresco setting, the Veranda Lobby Lounge serves snacks, pastries, afternoon teas and cocktails. Free Wi-Fi Hot Spots are available at Angsana Resort & Spa Lobby. Easily on par with any other course the world has to offer, the Greg Norman-designed Laguna Bintan Golf Course offers 18 holes of sheer golfing bliss for the novice and veteran alike. Put away in a tropical Eden of forestlands, natural wetlands, beachfront coconut groves and an abandoned quarry, where nature defines the course � and you define the game. 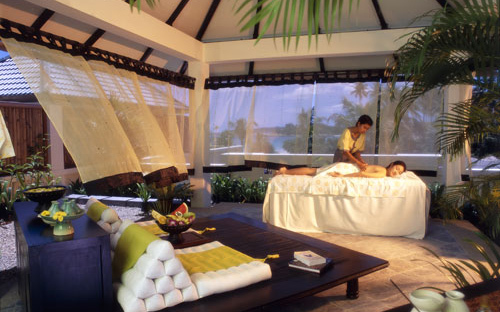 Angsana Spa Bintan is set in the picturesque Tanjung Said Bay of Indonesia, amidst tropical gardens and sunny beaches. With breathtaking views overlooking the azure waters of the South China Sea, Angsana Spa Bintan promises a blissful day spa experience. Angsana Spa Bintan is open from 9 a.m. to 10 p.m. daily. The Kid's Club is for children who are 3 to 10 years old. 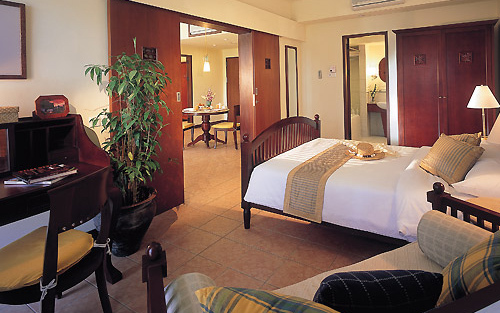 It is located at Room 123, opposite the Angsana Spa entrance. Tel: +62 77 069 3111; Fax: +62 77 069 3222. Located 40 kilometres from Singapore, Bintan is the largest of 3,200 islands in Indonesias Riau Archipelago. It is famed for its tropical forest, beautiful white beaches and championship-standard golf courses. Thus, the destination caters to a wide array of holidaymakers especially catering to family getaways and golf aficionados. Bintan's airport only caters to domestic flights, mainly operated by Riau Airlines which provide connections to Pekanbaru, Palembang, Jambi and the remote Natuna Islands. Most international travelers arrive from Singapore and Johor Bahru. Bintan is also the major domestic seaport for the Riau Islands and is a port of call for Indonesia's major passenger shipping company Pelni. There are several passenger ports in Bintan. The most common one is at Tanjung Pinang where most short-distance inter-island ferries and those from Singapore and Johor Bahru dock. Other ferry terminals are at Tanjung Uban, Kijang and Teluk Sebung which serves the Bintan Resorts area on the northern part of the island. Penguin, Indo Falcon and Berlian/Wavemaster companies operate ferries between Singapore's Tanah Merah Ferry Terminal and Tanjung Pinang. Together, they operate six ferries on weekdays, increasing to nine during weekends and public holidays. Ferries from Singapore take around 2 hours to get to Tanjung Pinang.